Infuse your home with the rich, natural scent of pomegranate, grapefruit, lemon, and orange with the Pomegranate Candle 3 Tots Gift Set. 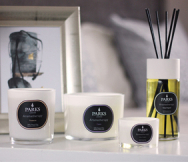 One of the signature scents within our renowned Aromatherapy collection, our pomegranate scented pure wax candles deliver a rich aroma throughout every room of your home – so you can enjoy one of the world’s best-loved fruit fragrances every day. Originating in the Middle East and now widely available across the Mediterranean, pomegranate is a distinct, berry-like fruit whose red skin emits a soft, subtle fragrance. The natural pomegranate oil we use in our candles is derived from this, enriching the pure wax with an indulgent, concentrated scent that’s renowned for its detoxifying and inspiring fragrance. To balance the rich, red-fruit aroma of pure pomegranate extract, we’ve added natural notes of citrus, including zest of grapefruit, lemon, and orange. This helps to balance and refine the fragrance, lending a fresh contrast to the dense, heady notes of pomegranate. As part of our Aromatherapy range, the Pomegranate candle has been developed to offer the utmost in soothing comfort and relaxation. Each candle in the gift set offers up to 20 hours of burn time, so you can infuse your whole home with the relaxing, joyful, and mood-lifting aroma of pomegranate and citrus fruit extracts. Delivered in a luxury gift box, our Aromatherapy Pomegranate 3 Tots Set is the ideal gift for a loved one who appreciates strong and sophisticated real fruit fragrances.